Hans Geiger was a German nuclear physicist (a person who studies the inner core of the atom) best known for his invention of the Geiger counter, a device used for detecting and counting atomic particles, and for his work in nuclear physics with Ernest Rutherford (1871–1937). Johannes Wilhelm Geiger was born in Neustadt an-der-Haardt (now Neustadt ander-Weinstrasse), Germany, on September 30, 1882. His father, Wilhelm Ludwig Geiger, was a professor at the University of Erlangen from 1891 to 1920. The eldest of five children, Geiger was educated first at Erlangen Gymnasium, from which he graduated in 1901. After completing his required military service, he studied physics (the study of the relationship between matter and energy) at the University of Munich and at the University of Erlangen, receiving a doctorate from Erlangen in 1906 for his study of electrical releases through gases. Geiger moved to Manchester University in England, where he met Ernest Rutherford, head of the physics department. Rutherford and Geiger began a lifelong personal and professional friendship. They began experiments based on Rutherford's detection of the release of alpha particles (particles with "positive" electric charges) from radioactive substances (substances whose atoms give off particles of matter and harmful rays of energy). Since alpha particles can penetrate thin walls of solids, Rutherford and Geiger presumed that they could also move through atoms. Geiger designed a machine that would shoot alpha particles through gold foil onto a screen, where they were observed as tiny flashes of light. Counting the thousands of flashes per minute was a long, hard task. Geiger decided to try to invent an easier, more accurate way to count them. His solution was an early version of the "Geiger counter," an electrical machine designed to count released alpha particles. In 1912 Geiger returned to Germany as director of the new Laboratory for Radioactivity at the Physikalisch-Technische Reichsanstalt in Berlin, Germany, where he invented an instrument for measuring not only alpha particles but other types of radiation (the giving off of energy and particles from atoms) as well. Geiger's research was interrupted by the start of World War I (1914–18; a war fought between the German-led Central Powers and the Allies—England, the United States, Italy, and other nations), during which he fought with the German troops. Crouching in trenches on the front lines left Geiger with painful rheumatism (stiffness and pain in the joints). With the war over, Geiger returned to the Reichsanstalt. In 1920 he married Elisabeth Heffter, with whom he had three sons. In 1925 Geiger became professor of physics at the University of Kiel, Germany. While there he developed, with Walther Mueller, the Geiger-Mueller counter, commonly referred to as the Geiger counter. The counter can locate a speeding alpha particle within about one centimeter in space and to within a hundred-millionth second in time. In 1925 Geiger used his counter to confirm the existence of light quantum, or packets of energy. Geiger left Kiel for the University of Tubingen in October of 1929 to serve as professor of physics and director of research at its physics institute. Installed at the Institute, Geiger worked constantly to increase the Geiger counter's speed and ability to detect. As a result of his efforts, he was able to discover bursts of radiation called cosmic-ray showers, and he concentrated on their study for the rest of his career. 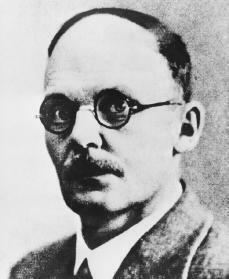 Geiger returned to Berlin in 1936 upon being offered the chair of physics at the Technische Hochschule. He continued experimenting and improving the counter. He also became involved with politics after Adolf Hitler's (1889–1945) rise to power in Germany's National Socialist Party. Geiger and many other scientists did not want the government to interfere with or influence their work. He helped compose a position paper that was signed by seventy-five of Germany's most notable physicists. The paper was presented to Hitler's Education Ministry in late 1936. The document urged the government to keep its hands off science, complaining that there were too few new physicists and that students were avoiding the subject in Germany because of newspaper attacks on physics by National Socialists. Geiger continued working at the Technische Hochschule through World War II (1939–45; a war fought between the Axis powers—Germany, Italy, and Japan—and the Allied powers—Great Britain, France, the Soviet Union, and the United States), although he was often confined to bed with rheumatism. He had just started to show signs of improvement in his health when his home near Babelsberg, Germany, was occupied in June 1945. Geiger was forced to flee to Potsdam, Germany, where he died on September 24, 1945. Beyerchen, Alan D. Scientists under Hitler: Politics and the Physics Community in the Third Reich. New Haven, CT: Yale University Press, 1979. Dictionary of Scientific Biography. vol. 5. New York: Scribner, 1972, pp. 330–333. Williams, Trevor I. A Biographical Dictionary of Scientists. New York: John Wiley & Sons, 1982, p. 211. Was Professor Geiger Jewish? I have heard this but cannot understand how a Jewish person could have served Hitler. Hey, I'm doing a research on this guy in Science so if you can give me more information that would be great!